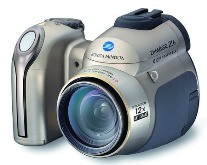 DigitalCameraInfo (link dead): The DiMAGE Z6 is a budget compact camera with a 12x lens. It’s not budget in terms of construction – Konica Minolta’s Anti-Shake mechanism moves the CCD, not a lens element, after all. It performs like a budget camera, though. An ultra zoom should have more serious capability than the Z6 offers. The displays aren’t good enough to check the images; they’re small, and low-resolution. The ISO ratings are limiting, too. ISO 320 just isn’t good enough for available light shooting indoors. A fair number of bird watchers use super zooms, and ISO 320 sure won’t be good enough to catch the twilight-feeding warblers and finches. Users looking to graduate from point-and-shoot models may be content with the Z6. It offers a long zoom lens with Anti-shake technology, manual exposure controls, and a strong software package at an affordable price. However, those looking to push the limits of fixed-lens cameras should look elsewhere.